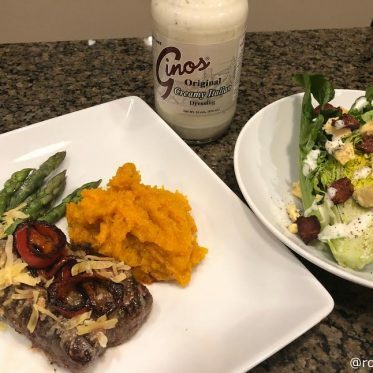 Whether for Valentine’s Day, an anniversary, a birthday, or any occasion, this is my go-to steak dinner that’s sure to impress. 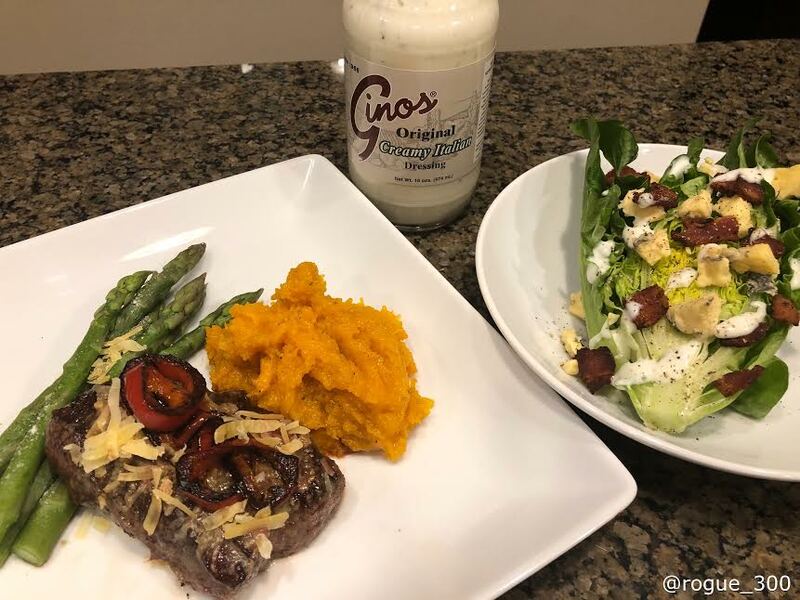 Instead of heading out to a restaurant, treat yourself and a special someone to a lovely dinner in because this steakhouse quality dinner at home won’t let you down. Preheat oven to 450F. Toss the cubed squash in 1 TB of olive oil and spread out on a rimmed baking sheet. Season with salt & pepper. Roast until easily pierced with a fork – about 20 minutes. While the squash is roasting, heat a heavy, oven safe skillet (I break out my cast iron for this) over medium high heat. Add the olive oil, and the pepper rings. Cook until slightly charred on each side about 2 minutes per side. Set aside. Pat the steaks dry with paper towels (this helps you to get a nice sear). Add the ghee to the skillet, once melted, add the steaks. Sprinkle with a liberal amount salt and little pepper to taste. Allow the steaks to sear without moving them for 2 to 3 minutes, flip and sear for another 1 minute. Transfer the skillet to the oven and cook to desired doneness – about 5 to 6 minutes for rare/medium-rare, 8 minutes for medium. Remove skillet from oven and sprinkle on shredded cheese. Return to oven and allow cheese to mostly melt – about 1 to 2 minutes. Remove from oven, twist pepper rings into a figure 8 and place 2 on each steak. Allow steak to rest for 5 to 10 minutes. Using a fork, mash the cooked squash, stir in the honey or maple syrup and a pinch of cayenne (more or less depending on your preference). Set aside. Trim the end off the romaine, leaving the connecting stalk intact, and cut the head in half from stalk to tip. Arrange each half on a place or in a shallow bowl. Divide the blue cheese and bacon between each wedge and drizzle with the dressing of your choice. Pour a glass of wine, beer, or mix up your favorite cocktail. Serve the steaks with the mashed butternut squash and enjoy your incredibly easy steak dinner that rivals anything you can find in a steakhouse. For an extra special treat, serve one of our amazing baked goods for dessert – this meal pairs perfectly with cheesecake or cream puffs. Previous PostIFC Distribution is Today (or Tomorrow in Ames)! Next PostIFC Distribution is Today (or Tomorrow in Ames)! © 2019 Iowa Food Cooperative.